Virginia has never had it easy. After her life is torn apart, she moves to a small town with the hope of starting over. She settles in and starts learning to enjoy a slower pace of life. Then, one evening she decides to take a walk to check out a mysterious mansion at the end of her block. Curiosity may have killed the cat, but because of it Virginia is about to make a terrifying discovery. As she peers through the mansion’s window, she sees a massive black-robed figure with grotesque fangs. Horrified, Virginia attempts to flee — but finds herself stopped in her tracks and plunged into darkness. After she awakens inside the house, Virginia comes face-to-face with its secrets — Teresa, the beautiful woman at her bedside; Max, the seemingly sinister old man; and Count Basarab Musat, a Transylvanian vampire who manipulates and controls everything — and everyone — around him. Soon Virginia realizes she is a prisoner, and what the Count has planned for her throws her into a battle for her survival. Unsure whether she will ever be free from this new and dangerous world, Virginia becomes a desperate woman who will stop at nothing to return to the life she once knew. I could not put the book down I hungered for more! Such a great read, with gripping suspense from page one through to the last. Leaves the reader looking for book two immediately after reading. And I thought I was not a “vampire” person. Wow was I wrong. This is a must read book, and especially for anyone with connections to Brantford. The beginning of Virginia’s story is terrifying and magical – a fabulous introduction to the Night’s Trilogy. I’ve read the first book, it was awesome! I’d really like to read the rest, and the gift card would really help me be able to achieve that :). 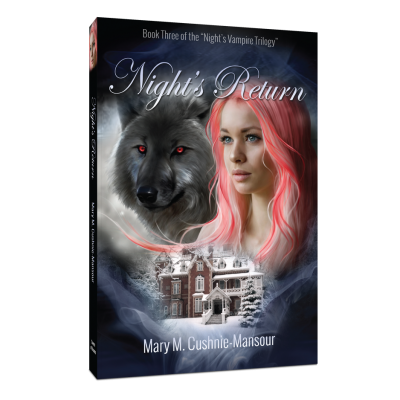 I love vampire stories, and Mary has written an awesome story! I couldn’t put it down, I finished it in about 2 days!!! Awesome book, couldn’t put it down. Mary draws you into the book as if you are in the same room with her characters. I have to say right from the beginning of Night’s gift i was in hook, line and sinker,Mary makes it so you can picture every character and room so clearly that you actually feel like you are in the room with them yelling ,crying and falling in love with the characters, What would you do if you were in Virginias place, you really need to read the book and let mary take you on this scary but awsome adventure. For those that like vampire novels and for those that don’t, I would recommend this book. It is filled with intrigue, mystery, suspense fear and love. Now where can you get all these emotions in one book? Brilliantly written. 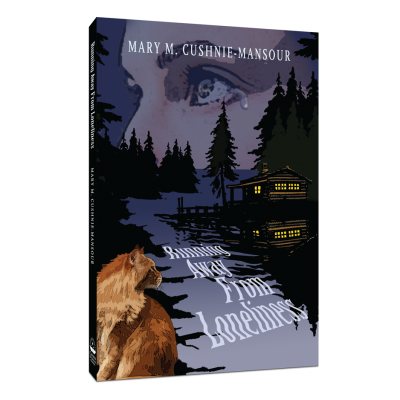 Congratulations to Mary Cushnie-Mansour on bringing a well written trilogy to us. When young, I read everthing that made my blood run cold in my veins and my heart thump in fear. I turned to soft reading. Curious about Mary’s writings, I read Night’s Gift”. Decided it wasn’t for me. But, I could not put it down. Now I cannot wait to complete reading the “Trilogy” in its completeness. Great Writer! Keeps you in anticipation. 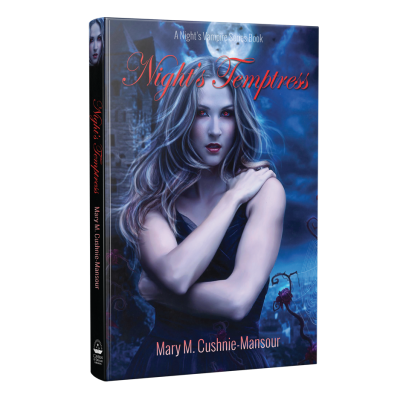 Mary has created an interesting spin in the Vampire genre, by giving a Canadian flavour to her stories. The cliffhanger ending leaves you anxious to read about Virginia in the next installment. Virginia feels that she is all alone in the world. Her parents are gone and she just threw out her cheating boyfriend. Needing a new start she moves from Toronto to Brantford, starts a new job, hopes to enrol in college classes and get her life back on track. Everything seems to be going well until she is out for a late evening stroll and her curiousity gets the better of her. The old (seemingly deserted) mansion at the end of the street is beckoning. She just wants to take a peek through the window. What she sees astounds and terrifies her, and through a series of misfortunes she finds herself held prisoner within its walls. This book was given to me as a gift, and as I read the author’s forward I was not expecting too much. 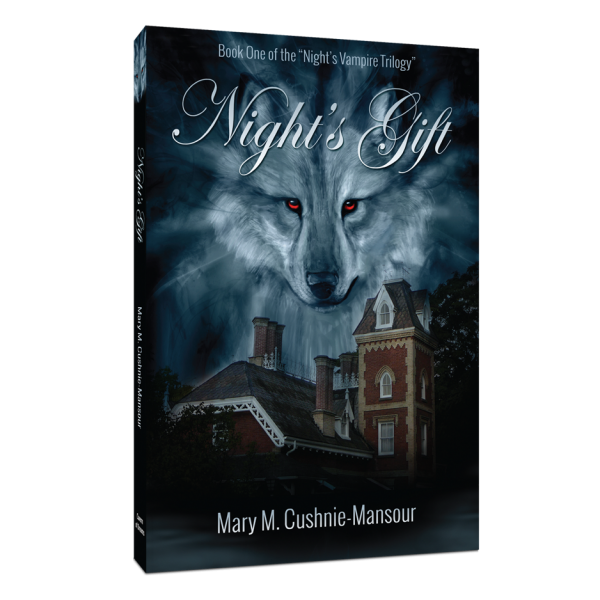 Ms. Cushnie-Mansour freely admits she self-published because her friends urged her to get this book out now to get in on the “vampire bandwagon”. Because the book was a gift I felt obligated to read the whole thing. Had I purchased it or borrowed it from the library I might have put it aside after the first few chapters. That would have been too bad because I ended up enjoying the story. 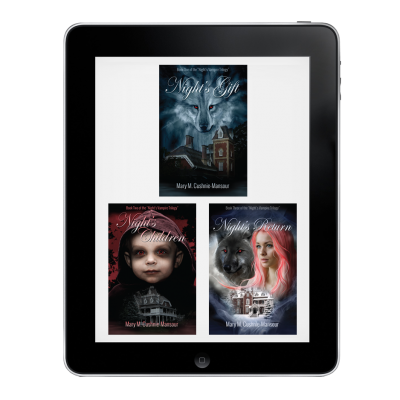 Although I found the beginning a bit tedious the author seemed to find her voice and strength as the book continued, so much so that I recently purchased the e-book of the second instalment to the trilogy. I appreciated that she stayed true to the original vampire lore (no sunlight, no food, aversion to crosses) but she did stray from the “undead” theory. She presented an excellent scenario for the creation of the “vampyre” giving the reader a little history lesson in the process. It made the premise of her story a little more believable (as believable as a vampire story can be). It’s all a little difficult to explain with a big “spoiler alert” at the top of the review so I’ll stop at what I’ve written. Although I wouldn’t rave about the book with 5 stars, it was definitely worth the read if you are a fan of the genre. I’d like to publicly thank my friend, (another) Mary for the gift. The house the book is based on exists and the artwork on the front of the book depicts it. She included newspaper clippings about the house being featured in this book as well as having the book signed. Always nice! I’m so glad that when I finished Night’s Gift, I had purchased Night’s Children to continue on reading. As i mentioned in the Night’s Gift, This should be made into a movie and produced right here in Brantford. The Castle is here and there is no need to make props. From the moment I finished Night’s Gift, I continued reading into Night’s Children. Once again I was quickened with suspense as to what was going to happen to Virginia’s life? As this new shift unfolded, I was drawn into more wonder as to what was going to happen to Virginia and her children. How is this going to unfold and end? What will happen to Virginia’s life and where will she end up? New characters are introduced. What will Randy’s final role be in virginia’s life? Now since i am finished this book, I thirst for the final trilogy. Mary M. Cushine-Mansour has a way of writing with flow where the reader does not want to put the book down. The chapters in the book do not end, as they do in other books, they blend into the next scene / chapter and your are demanded to keep reading. Love these kind of books. Thank you Mary. This novel shows a great amount of creativity. The way Mary can capture the history of vampires is incredible in itself. You can feel like you are a part of a world that has become your own. In this first novel, it really captures these characters (Basarab and Virginia) in their growing relationship. You really are hooked.